The word “mourning” (irei) has become common in everyday life. In many places, cenotaphs (ireihi) are being built and memorial services (ireisai) are being held. Approximately one month prior to the publication of this issue, memorial services were held throughout the Tohoku area to commemorate the fifth anniversary of the Tohoku earthquake and tsunami. This summer, the season of mourning for victims of World War II will arrive once again. However, when we carefully consider the question of what mourning is, we realize that a clear definition does not exist. Generally, “mourning” (irei) refers to a service to grieve the dead, but there are also other similar words such as “commemoration” (tsuito), “condolence” (aito), and “invocation of the dead” (shokon). The difference between the meanings of these words is unclear. In the case of “commemoration” and “mourning,” there are times when it seems the former term refers to a secular act and the latter to a religious act, but there is no consensus even among researchers.1 In the first place, we do not have a special way of mourning. In postwar Japan, which is bound by the principle of the separation of the church and state, mourning that uses public funding cannot be tied to any specific religion. An online search for cenotaphs yields various types of architectural objects with no single principle of design, and there seems to be no set convention for the progression of memorial services. When we mourn, it may even be unclear who is mourning what spirit and how. That is the reality of the mourning that we see daily in newspapers and on television. I wonder why mourning is such an ambiguous act in this nation. Commemoration has certainly existed since ancient times and so have funerals. However, the history of the word “mourning” (irei) is unexpectedly recent. Therein lies a clue to our exploration. The Yasukuni Shrine was established under the name “Tokyo Shrine for the Invocation of the Dead” (Tokyo Shokonsha) in 1869, a year after the Meiji Restoration. As the original name indicates, the act of collective commemoration by the state was, at the time, referred to not as mourning but as an “invocation of the dead.” This situation did not change until Japan was defeated in World War II. Even now, at old shrines or parks, one can easily find mosscovered stone structures engraved not as cenotaphs (ireihi), but as monuments for the invocation of the dead (shokonhi). What is important here is that in regards to the invocation of the dead, the question of who is invoking and which dead person is being invoked was far clearer then than it is now. At Tokyo Shokonsha, those doing the invoking were the authorities who had amassed victories in the Meiji Restoration—those who supported the motto “Revere the Emperor, Expel the Barbarians” (sonno joi)—while those being invoked were the spirits of patriots, or national martyrs, who had sacrificed their lives in the process of the revolution and built the foundations for a new state. The spirits of the rebel army were simply ignored, though they were also part of the Japanese nation. Then, what about the history of mourning (irei)? This word did not exist at the time of the Restoration, and if we trace it back through document databases, it does not appear until after the Russo-Japanese War.2 It was popularized far later: Shogakkan’s Japanese Dictionary (Nihon kokugo daijiten, 2nd ed.) lists the earliest appearance of the term “memorial service” (ireisai) as occurring in a 1933 Shiro Ozaki novel. As the earliest example of “cenotaph” (ireihi), the dictionary lists an appearance in a 1976 novel by Ayako Sono, published more than two decades after the War. Irei seems to have been a new word that circulated as a convenient substitute for the preceding shokon, which had become tied to the memory of militarism and therefore difficult to use in postwar Japan. For example, the Yasukuni Shrine’s semi-official guidebook summarizes the changes that took place after Japan’s defeat as follows: “The services of Yasukuni Shrine, which up until now have been directly connected to military affairs, have deepened the character of mourning for the dead, which is based in time-honored ancestor worship rituals.”3 Thus, the focus moved from military affairs to ancestor worship rituals. Mourning is a word frequently used in these kinds of cases. Mourning is more than an ambiguous word without definition. Rather, it is a word that has managed to survive in postwar Japan through intentional ambiguous use. Irei was originally shokon, nothing more than a political and religious act underwritten by government authority. However, after the war, by changing the name and forgetting its history, Japanese people allowed the concept to survive as an unclear and somewhat depoliticized act, an irei without any consensus of who is mourning, whom is being mourned, and under what kind of authority. As a result of obscuring the political and historical implications of shokon by using the term irei, Japan continues to be embroiled in domestic and international difficulties in commemorating its war casualties from 70 years ago. Let us examine this issue more thoroughly. The history of mourning in postwar Japan is often discussed with reference to the Yasukuni Shrine. For this discussion, two books are especially important: Shigeyoshi Murakami’s 1974 book Mourning and Invocation of the Dead (Irei to shokon) and Tetsuya Takahashi’s 2005 book The Problem of Yasukuni (Yasukuni mondai). As mentioned, Yasukuni was established as a location to commemorate national martyrs for political reasons. Those who died for the Meiji state and those who died as rebels against the state are clearly distinguished in civil war records. The conservative samurai who rebelled against Meiji revolutionists will never be commemorated. Murakami and Takahashi’s books strongly criticize the violence inherent in this commemorative practice. However, as Benedict Anderson indicates in his book Imagined Communities,4 the graves of unnamed soldiers are at the core of nationalism.In that respect, we can say that Yasukuni was born out of Japan’s inevitably accelerated formation of the modern nation state and not something exceptional. Murakami’s and Takahashi’s criticisms seem too harsh for this reason. On the other hand, for the same reason, we can say that the rituals of Yasukuni are relatively recent political constructions, disconnected from Japanese premodern traditional spirituality [such as the Buddhist idea of the equality of friends and enemies (onshin byodo)]. Murakami painstakingly describes this disconnection, and Takahashi persuasively criticizes Jun Eto on this point.5 Just as it is wrong to take Yasukuni as a tradition inherent to Japan as a nation, considering it as an exceptional violence of the Empire of Japan is an overstatement. The problems of Yasukuni are, in that respect, problems of modernity in general. However, beyond the above premise, I want to express two of my own concerns regarding Murakami’s and Takahashi’s analyses. They are questions that consider the invocation of the dead and mourning from a different viewpoint than that of Yasukuni and represent an attempt to ponder these issues while maintaining some distance from the curse of modernity. The first is a concern I have regarding anonymity. Murakami, in the preface of his aforementioned work, states that “the progression from a shrine for the invocation of the dead to Yasukuni is nothing but the process by which the invocation of the individual spirits of those fallen in battle deteriorates into a situation in which the government unilaterally mourns and honors an impersonal group of deities called the ‘spirits of war heroes.’”6 In short, Murakami emphasizes that Yasukuni depriving the dead of their individual names and changing them into anonymous war heroes are acts of violence. This is the issue of “mass enshrinement” (goshi), and such violence is being fought from a legal standpoint in litigation to end mass enshrinement, which originated from various families of the bereaved from the former colonies of the Empire of Japan. From a traditional viewpoint, Japanese people lose their individuality when they die. If Yanagita’s expertise in folklore studies is reliable, the violence of mass enshrinement is clearly an extension of this argument. The spirits of war heroes (eirei) have no individuality. Each dead person loses his or her individuality and becomes part of the anonymous Spirit (mitama) the moment his or her name is written in the Book of Souls, and the person is enshrined in Yasukuni. As such, once the dead are enshrined, they cannot be disenshrined. That may indeed be an act of violence, but if so, there is no choice but to no longer think of it as the violence of the modern, but a violence that has long existed in this country. Japanese people live in a culture that forgets the dead to begin with. However, in this case, the argument is too simplistic. This is because in reality, commemoration and honoring cannot be clearly delineated but should rather be thought of as coming together to form a single process of mourning. Akira Nishimura’s ambitious work Postwar Japan and the Mourning of the War Dead (Sengo Nihon to senso shisha irei, 2006) is a useful reference regarding this point. According to Nishimura, mourning has two sides: “pacification” (shizume) and “invigoration” (furui). Literally, pacification calms emotions, while invigoration stimulates them. Generally speaking, pacification corresponds to mourning and invigoration to honoring. However, invigoration is not necessarily linked to nationalism and warmongering, and it is not necessarily forced by the political will of the state. For example, at memorial services for the victims of the atomic bombs in Hiroshima and Nagasaki, city residents pledge their efforts towards peace in front of cenotaphs, and this can be seen as a type of invigoration. What Nishimura stresses in this categorization is not the opposition of emotions or ideologies, such as sadness or happiness, loss or recognition, bereaved families or the state. Instead, he focuses on our relationship with time, i.e., whether we are facing the past or the future. In pacification, a community confronts past deaths. In invigoration, the community accepts the deaths and, moreover, takes a step towards the future. The image of the future that is shared in that instance may be one of war or one of peace. However, what is essential is the temporal structure, not the ideological content. Nishimura, referencing the speech act theory of J. L. Austin, states that invigoration is a “performative memory” that is “spurred on by the process of the living facing the future as subjects of history.”9 According to speech act theory, every utterance has two sides: a constative interpretation and a performative function. Similarly, every act of mourning may be thought of as having two sides: pacification that tends towards the past and invigoration that tends towards the future. Thus, we have no choice but to say that Takahashi’s proposal, in which the solution to the problem of Yasukuni lies in the creation of an environment that removes honoring from mourning and where commemoration does not change into honoring, is fundamentally impossible. Sadness always leads to happiness, and commemoration always changes into honoring. This duality is the very essence of mourning, and what we need is not a denial of honoring, but to explore what lies beyond honoring. Anonymity and invigoration have become objects of constant criticism by social thought that places importance on pacification and individual names, in other words, a set of values modeled on the idea of quiet mourning for the dead whose faces may be seen. Even in discussions surrounding Yasukuni, such criticisms have been repeated many times. However, in truth, the history of anonymity is older than Yasukuni, and the spread of invigoration extends beyond Yasukuni. In the Meiji period, uniquely designed cenotaphs for the invocation of the dead with unique messages were constructed without any governmental approval from the Ministry of Home Affairs.10 In the same way, now, after the earthquake in the Tohoku region, new cenotaphs are being constructed without approval from anyone. It is a fact that Yasukuni represents modern invocations of the dead or mourning, but the dynamism of these practices is certainly not confined to Yasukuni. Japan is furnished with a tradition that is quite troublesome, one that says that only by stealing names from the dead, forgetting the individuality of the dead, and changing them into an anonymous gathering of spirits can its people begin to be invigorated and turn towards the future.11 If so, what lies beyond that tradition? In thinking about this issue, we will need a new philosophy of mourning that cannot be exhausted by the politics surrounding Yasukuni. I arrived at the topic of “Mourning Spaces” as the featured topic of this volume by deliberating on these questions. As I am not a scholar of religious studies or folklore studies, the topic of mourning inevitably is a bit of a curveball for me. This special issue includes an interview with the religious studies scholar Shinichi Nakazawa, a proposal created for an exhibition at the Venice Biennale of Architecture 2016, a dialogue between the architect Taro Igarashi and the artist Yohei Kurose, and an essay by Boris Groys on the Russian philosophy of immortality. It would be pointless to further explain each text here in detail, so I shall avoid doing so. In reading them, you will see how the discourses resonate together, even while each text deals with a separate problem using a different approach. Moreover, you will easily understand that behind my selection of these texts are thoughts regarding Yasukuni and mourning as discussed above. During the process of editing, I unexpectedly discovered that the resonance of these thoughts had started to color the contributions to the volume that were not part of the special topic of mourning. For example, in the roundtable discussion on criticism in contemporary Japan, we addressed Norihiro Kato’s After Defeat (Haisengoron) and Yoshinori Kobayashi’s On the War (Sensoron). Kato and Kobayashi both write on the subject of mourning. The former was Takahashi’s opponent at the time, while Kobayashi, even now, is a controversial and extremely influential figure who defends the spirits of the war heroes of Yasukuni. Other examples are my two dialogues with Yasutaka Tsutsui and Masaya Chiba, respectively, where the topic of God was discussed. These can be linked to Nakazawa’s references to Hajime Tanabe and Groys’ topic of immortality. As a result, even when taken as a whole, Genron 2 is a book that considers from various angles the one shared problem of what sort of attitude or what type of value we, who live in twenty-first century Japan, should adopt while thinking about things beyond an individual’s death. Perhaps I have been unconsciously preoccupied with this topic. A philosophy of mourning still has not emerged, and this volume will not serve as an answer. Therefore, we may be led to plan another special feature on mourning in Genron in the near future. I hope this issue will be a starting point for readers to think about the puzzle of mourning. 1　Kokugakuin Daigaku Kenkyu Kaihatsu Suishin Senta (ed. ), Irei to kensho-no aida , Kinseisha, 2008, p. 5. 2　Akira Nishimura, Sengo Nihon to senso shisha irei ,Yushisha, 2006, p.16. 3　Jinja Honcho (ed. ), Yasukuni jinja , PHP shuppan, 2012, p. 22. 4　Benedict Anderson, Imagined Communities: Reflections on the Origin and Spread of Nationalism, New York: Verso, 1991, p.9 onwards. For a Japanese translation, see Sozono kyodotai, Riburopoto, 1987, p.24 onwards. 5　Tetsuya Takahashi, Yasukuni mondai , Chikuma shinsho, 2005, p.152 onwards. 6　Shigeyoshi Murakami, Irei to shokon , Iwanami shinsho, 1974, p.ii. 7　Kunio Yanagita, About Our Ancestors: The Japanese Family System, trans. Fanny Hagin Mayer and Yasuyo Ishiwara, New York: Greenwood Press, 1988, p.64,98. For Japanese original, see Yanagita Kunio zenshu 13, Chikuma bunko, 1990, p.65,108. 8　Takahashi, Yasukuni mondai , p.54. can say that Takahashi’s proposal in The Problem of Yasukuni that the establishment of commemoration without honoring implies an essential defect that does not simply cause a political unreality but can also be traced back to questioning his understanding of Derrida’s philosophy. Derrida states that constative speech cannot exist without its performative function and that there is no such thing as parole without écriture. If that is the case, Takahashi should have accepted that there is no such thing as mourning without honoring, which should be the starting point for a philosophy of mourning after Derridian deconstruction. 10　Regarding the history and changes of shokonhi, in addition to Nishimura’s book, the following essays may be of reference: Kenta Awazu,“The Establishment and Development of Regional Cenotaphs for the War Dead”(Chiiki-ni okeru senbotsushahi-no seiritsu to tenkai) in Kokyo Murakami and Akira Nishimura (eds. ), The Genealogy of Mourning (Irei-no keifu), Shinwasha, 2013. 11　This viewpoint on anonymity and invigoration (that when Japanese people make contact with the anonymous collective spirit, they feel invigorated for the first time) is something that may also be useful in understanding the essence of the popular culture that developed in the 2000s, especially using the internet as its stage. There is a parallel that cannot be ignored between Japan’s otaku subculture, particularly its affection for characters (kyara), and the peculiar ancestor worship that Yanagita indicates. This may partially explain Japanese otaku’s political right-wing affinity. Yuichi Murakami’s Conditions of a Ghost (Gosuto-no joken , Kodansha, 2011) or Sayawaka’s Theory of Characters (Kyara-no shikoho , Seidosha, 2015) may for now be of reference as a case study. Japan is a nation of disasters. One-fifth of the world’s major earthquakes and a seventh of the world’s terrestrial volcanoes are concentrated on this narrow archipelago. Typhoons also ravage its lands every year and claim lives — over 5,000 people lost their lives to Typhoon Vera (Isewan Typhoon) in 1959. Japan is a nation of war. Since ancient times, a diverse range of peoples have made their way to this island nation situated at the eastern end of the continent. Included among them were warrior clans. The Japanese kingship is a kingship of conquerors. The myths of Japan are woven from records of these conquests. The kingship continued its expansion in the medieval period by conquering its northern frontiers of the Emishi, and its people, too, took to the southern seas as Wako pirates. An anomalous era of stability and peace arrived during the early modern period, but soon times of war and chaos returned. Japanese casualties in the Second World War reached three million. Hence, Japan is a nation of the dead. Not only that, it is a haunted nation of the dead. It is a nation that has forged ahead in its history through consoling the ghosts of those that met their unfortunate ends in calamities and wars, and were thereby kept from realizing a happy life. Since ancient times, Japanese writers and artists knew this well, as did its politicians. The oldest Japanese anthology of poetry, The Collection of Ten Thousand Leaves, contains many elegies. The traditional theater art of Noh achieved its heights by taking the dead as its protagonists. Even today, Japan has many more cenotaphs than it does museums of disaster or war memorials. Many Japanese today have forgotten these conditions. In fact in these seventy years since the end of the Second World War, Japan has experienced an exceptionally quiet era, with no major volcanic eruptions and only a few major earthquakes. But in exchange for this peace it has lost the wisdom to memorialize the dead, appease ghosts, and press history forward. Consequently, Japan has fallen into a position of immobility as it continues to be possessed by the ghosts born from the war. It refuses to face the calamitous reality, even after the nuclear accident in 2011. This is why we would like to propose an architectural apparatus that will summon the ghosts that have shaped the history of Japan, making them visible so that we may lend an ear to their voices, quell their anger, and return them to the other world. We wish to build a space of contradiction where one can experience the difficult relationship between the living and the dead—a place that is at once a cenotaph, disaster museum, war memorial, park, as well as a learning center, house of horrors, and theme park. A structure that is a shelter for the dead rather than a home for the living. The philosopher Takeshi Umehara argues that Horyuji Temple, one of the oldest Japanese Buddhist institutions established in the 7th century, was built to appease the ghosts of a clan that was assassinated after falling from power. If such is the case, we could also say that with this proposal we are returning to the origins of Japanese architecture. We live in a land of calamities and ghosts. If we suppose that European architecture summons its earthly spirits, and European philosophy, using Heidegger, has made its way towards the houses of the living, then Japanese architecture, too, must summon its ghosts, and Japanese philosophy, through the Kyoto School, must also find its way towards the shelters of the dead. Our proposal seeks to submit to a world audience at Venice the idea of architecture not meant as houses for the living, but as shelters for the dead. We believe this plan may offer an alternative to the global city and market, which are customized only for the happiness of the living. At the same time, it may also provide an important intervention into the present state of our nation, which produced a catastrophic nuclear accident only to fall quickly into its forgetting. Shinichi Nakazawa debuted in 1983 with Mozart in Tibet (Chibetto no Motsuaruto); he was one of the pioneers of “New Academism” in 1980s Japan. Since then, he has developed a unique philosophy that traverses numerous domains of knowledge, including religious studies and cultural anthropology. In this interview, Hiroki Azuma poses one central question to Nakazawa: given the tendency towards utilitarianism in contemporary Japanese society, what kind of theoretical resources can we consider regarding the question of “transcending the death of the individual”? Furthermore, how can the question avoid the traps of ideology and patriotism? Nakazawa offers two answers. The first involves revisiting the “logic of species” developed by the Kyoto School philosopher Hajime Tanabe; the second answer relates to the development of a geo-philosophy. First, in his logic of species theory, Tanabe argues that “species” served as the foundation of pre-Socratic and non-Western philosophies and that the “individual” can only be considered to emerge from within it. Tanabe attempted to imagine an ideal state within this context. Nakazawa remarked that the concept of “species” is still instructive today when reflecting on various issues, for example those of ethnicity. It is useful when considering Azuma’s question as well, particularly since it has become difficult to incorporate individuals’ deaths into a communal narrative in Japan today. What possibilities can we then find in a form of remembrance mediated by the species? We can find hints in the summer festivals (natsu matsuri) celebrated in the Tohoku region after the 2011 earthquake. The collective consciousness has already actualized remembrances based on the concept of species. In contrast, ie (house), the traditional realization of the species, or collectives like merchant and farming families are no longer functional today in Japan. Only the symbolic Emperor System has continued with the image of the ie in the postwar era. Second, geo is a prefix found in words such as geography and geopolitics, and it refers to the land. Nakazawa suggested that we must reconsider the relation between land and philosophy. For example, if we consider Japan from a geopolitical perspective, it is interesting to note that the Wa people who brought rice cultivation to Japan once belonged to the Miao people, a mountainous ethnic minority in southern China. The characteristics of the Japanese nation as a state apparatus can be traced back to the mobility of mountain peoples, whose societies are radically different from those of the peoples residing in the plains; this is related to the characteristics of the ie and the Japanese Emperor System as well. The Japanese people’s ie system is “plant-like” in nature. Though rooted in the ground, plants also retain mobility by spreading pollen and seeds through the air. We can say that a human’s death in Japan may have been imagined, recoded, and remembered like a plant’s collective death, although it resembles an animal’s individual death in Western traditions. The Japanese Emperor is the king of plants who exists to appease the inadama (spirits of rice); however, no national system of remembering individual’s deaths exists. An individual’s separate death is not considered an issue in plant-like forms of remembrance. This fact is also related to the state’s way of remembering the dead from World War II. After the war, Kunio Yanagita wrote About Our Ancestors (1946:1988), offering a contrast to the Yasukuni Shrine’s practice of enshrining all the dead as eirei (glorious war dead). According to Yanagita, the spirits of the dead in Japan have always returned to the mountains and forests and have always been mourned in local festivals and rituals. Today, Japan has many debates about preserving the architectural remains from the earthquake, especially the nuclear disaster site, but Nakazawa suggests that it would be more appropriate to convert these sites into forests; increasing the number of forests/sanctuaries is much more harmonious with the original Japanese remembrance methods than increasing the number of cenotaphs or museums. In modern Japan, the chureito, which entomb the remains of soldiers scattered on battlefields, emerged as a new type of memorial architecture follow ing the 1904 -1905 Russo-Japanese War. In the 1930s, Chuta Ito contributed to the building of the Earthquake Memorial Hall (Shinsai kinendo) and the Main Gate (Shinmon) of Yasukuni Shrine. Here we can obser ve the practice of linking design to “Japaneseness.” Many modernist architects participated in the government-sponsored competition for a chureito design during the war in 1939. Yet, despite the populist mood of the competition in which even elementar y school students submitted proposals, only works shaped like tombstones won prizes. Kenzo Tange was an architect who sought to combine traditional design with the idea of modernism that emerged in this context. He rose to fame in 1942 when his submission won first prize in the competition for the design of the Greater East Asia Co -Prosperity Sphere Memorial Hall. This plan to build a sanctuar y for loyal spirits at the base of Mt. Fuji was done on a massive scale on a level that we might call national reconfiguration. A fter the war, Hiroshima planned to construct a memorial hall (ireido) at the ground zero site where the atomic bomb was dropped. Yet, the guidelines of the 1949 Peace Memorial Plan omitted it because of political considerations while under the United States, occupation. Tange attempted to revive the idea and incorporate it in his proposal for the Peace Museum when he won the competition for the Hiroshima Peace Memorial Park. Yet, the plan was scrapped again due to the consideration of Japanese people’s feelings because Isamu Noguchi, whom Tange commissioned the hall’s design, was an A merican citizen. Therefore, the Peace Memorial Plan was already politicized right from when it was planned. Tange, who had lost his friend in the war, was finally able to realize his hopes of building a memorial in 1966 through his design of the Student Soldier Memorial Hall (Senbotsu gakuto kinenkan) on Awaji Island. Yet, it received ver y little coverage in architecture journals because he avoided informing the public of his client’s political position. Thus, the Student Soldier Memorial Hall is an unknown masterpiece of the architect even today. A fter the Great East Japan Earthquake, Hiroki A zuma est ablished the Fukushima Daiichi Nuclear Power Plant Tourization Project, a plan that transforms the nuclear power plant disaster site into a tourist destination, with the aim of imparting its memor y to future generations and making information about the disaster transparent. Follow ing the project’s positive reception, A zuma was inv ited to participate in Japan pavilion’s domestic competition at the Venice Biennale of A rchitecture 2016. Though his proposal did not win, it received recognition for exploring the notion of architecture beyond death. In a recent roundtable, A zuma revisited this topic during a conversation w ith architectural historian Taro Igarashi and art critic Yohei Kurose. Igarashi recalled seeing many architectural remains in towns like Onagawa, Miyagi Prefecture, that were affected by the disaster and that he felt needed to be preser ved, only to discover that they had been subsequently removed. A fter the 2008 Sichuan earthquake in China, a portion of the affected area was preser ved in its immediate post-earthquake state as part of a government project. However, such an undertaking would be difficult in Japan. Only a few architects, such as Arata Isozaki and Ryuji Fujimura, have proposed large-scale post-earthquake projects, whereas a prevailing sense of impotence, and a belief that the architects’ v isions or conceptions are no longer needed, is proliferating in post-disaster Japan. Here, A zuma obser ved a characteristic particular to Japanese culture, where actual and present interests always over whelm the challenge to impart memories to future generations. According to Igarashi, Japanese architecture’s transient nature can be traced to its wooden architecture tradition; the Japanese people had never acquired the materials and techniques necessar y to build permanent constructions until they were confronted with European civilization just 150 years ago. Kurose obser ved a similar situation in the art realm; the permanent techniques of European oil paintings and sculptures were closely linked to the idea of nationalism in modern Japan. In consequence, many Japanese are still reluctant to undertake the task of creating something beyond death. Igarashi remarked that Japanese art museums are socially accepted only as temporar y exhibition forums. The Japanese people do not consider that art museums preser ve and manage works that will exist beyond their death. A zuma added that they cannot be sites of “stock ” but are instead sites of “flow” and that Tokyo’s National A rt Center designed by K isho Kurokawa is a representative example. Japanese society considers the civil engineering and construction industries as extremely important, and its government is now allocating more resources in these spheres for the restoration of the Tohoku regions. You can see this, for example, in the nightmarishly massive conveyor belts that have been installed to build new embankments in R ikuzentakata in Iwate Prefecture. Kurose argued that people may find a new way to retain memories in accordance with their sentimental attachment to places. A zuma concluded the conversation by stressing the need for a new invention in Japan: the creation of places that allow the spatial stocking or archiving of objects, people, and spirits, rather than simply flow ing away or mobilizing them through time. In 1989, due to the influence of the ideological confrontation between East and West and the significant events occurring in Western society regarding the resolution of that confrontation, Japanese criticism, too, reached a turning point. The cult of productionism—that is, the unwavering faith in the act of production—, long at the center of Japanese society, quickly lost steam and a consumer-based society began to settle in. At this juncture a new definition of femininity hitherto alienated from production began to assume a central position within this new value system; here, femininity redefined itself as a fetishism of consumption. The axis of criticism also shifted from a set of norms and ethics employed for the sake of production to the question of how to understand consumption and illusion. At the center of this shift were two thinkers: Eiji Otsuka, who discussed in The Generation of M (M-no sedai, 1989) the serial kidnapping and murders of young girls by Tsutomu Miyazaki, and the then up-and-coming sociologist Shinji Miyadai, who discussed both the practice of “compensated dating” (enjo kosai) by school girls and the 1995 Tokyo sarin subway attack by Aum Shinrikyo. Just as manga artist Yoshinori Kobayashi pointed out early on, the new actors of the swelling consumer society developed a desire to be respected as a reader, a sentiment that also bled into to the world of criticism. However, with the conclusion of the Cold War, it became clear that this was not an end-of-time scenario in which people— or the individual— were to take center stage. Having lost this central positioning, many people felt as if it were the beginning of an “endless everyday” (owarinaki nichijo). The dream of experiencing glory as the lead actor within the drama known as modernization and productionism—a dream dreamt since the Meiji Period—suddenly vanished. Through the importation of Western culture the modernism of Japan sought to ensure a complete human subject. One result of this desire, however, was the creation of an infinite number of statistical subjects, i.e., individuals. Such a development, which would continue through the twenty-first century, is linked to the emergence of a sociological and statistical practice that quantifies the individuals. The fall of criticism was also predicated on this movement towards analyzing the indiv idual. As a result of this change the critical discourse by hitherto ignored (as the subject of criticism) female writers was brought to the forefront. Within Japan’s production-capitalist society women were regarded as those who lacked promise. Thus, when it became the norm that the indiv idual was no longer the main player, many women—who had long been accustomed to such a condition—found a space for themselves to become involved. Accompanying this newly decentralized mode of criticism was a large cohort of female thinkers, including writers such as the sociologist Chizuko Ueno, the science fiction critic Mari Kotani, and manga critic Yukari Fujimoto. Each dismantled the boundaries of genre, attempting to break into an already existing culture. These changes also rewrote the context of traditional Japanese criticism. Critics including Kojin K aratani, who were active in shouldering a normative modernit y, lost sight of the “enemy” they were poised to fight against in 1990s. Traditional criticism, which tended to focus on professional authors, became to be regarded as nothing more than personal expression. On the other hand, the newly established disciplines of sociolog y and statistics lacked the abilit y to move beyond an analysis of the contemporar y world. 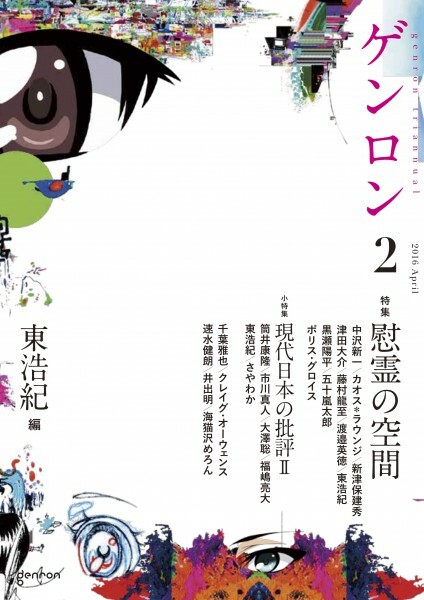 The publication of Otaku: Japan’s Database Animals (2001: 2009)by Hiroki A zuma at the turn of the twenty-first centur y would offer a resolution to this crisis of representation within the critical world. One might say that the appearance of such a thinker was the result of the age. This group discussion, comprised of four critics in their forties or younger, follows a discussion of the history of criticism in Japan from 1975 to 1989. The second discussion of three, it looks at the years 1989 – 2001. Some of the major critics (ronkyaku) who made their debut during this period include Eiji Otsuka, Shinji Miyadai, and Yoshinori Kobayashi. This discussion focuses on the respective merits and demerits of their ideas. The round-table begins with a recognition by Makoto Ichikawa, the author of the accompany ing report, that “with the end of the Cold War in 1989 came a retreat of the importance placed on an ideological confrontation between East and West”. Additionally, the development of a strong consumption culture was emphasized. Hiroki Azuma, agreeing with Ichikawa, notes the successive publication of numerous works that takes as their topic the means by which an individual might live in a world which is devoid of such an ideological dichotomy. Some of these texts include the work by Eiji Otsuka and others, The Generation of M (M-no Sedai, 1989), Wataru Tsurumi’s The Complete Suicide Manual (Kanzen jisatsu manyuaru, 19 93), and Shinji Miyadai’s The Choice of Girls in School Uniforms (Seifuku shojotachi-no sentaku,1994). With a political climate in which a re-examination of the post war political and social arrangement of Japan becoming more and more necessary, the first half of the 1990s saw the publication of numerous thematically and methodologically ambitious texts. However, this trend of revisiting the postwar period dissipated in 1995 with the sense of shock accompanying both the Kobe earthquake and Tokyo subway sarin gas attack by Aum Shinrikyo. Ryota Fukushima notes that by the end of 1995 Japanese-language critical discourses in general abruptly changed style: it transformed from a manic state to a melancholic one. Emblematic of this shift was the debate Norihiro Kato sparked with his After Defeat (Haisengo-ron, 19 97), especially with his discussion of war responsibility, its relationship to Yasukuni Shrine, and the post-war Japanese mode of self-evaluation. Criticism in the 1990s deconstructs its form of expression, spreading far beyond its traditional borders and moving across genres. A representative work of this enhanced criticism would be the piece of social criticism in manga form, Gomanism Manifesto (Gomanizumu sengen, 1993), by Yoshinori Kobayashi. Satoshi Osawa remarks that Kobayashi was involved in actual activism. The media environment changed, and criticism was no longer able to garner influence simply by means of the written text. Another key player was the late-night television debate program with journalist Soichiro Tahara, Live TV till Morning! (Asa made nama terebi! , 1987-). As a result of these changes, the center of the social criticism shifted from the printed word to television shows and manga images. Additionally, the 1990s saw the dissemination of the internet and the expansion of Comiket (also known as Comic Market), the world’s largest marketplace for self-published works (dojinshi) and the center of so-called otaku culture. During this time various “subcultures” emerged, and people’s access to information intensified; the traditional focus of criticism (i.e., pure literature) disappeared. While the work of Otsuka and Kobayashi still prioritized works by professionals, Hiroki Azuma’s Otaku: Japan’s Database Animals (2001:2009) focused on the creative power of fans, or amateur consumers. The decline of ideology and the changes within media further accelerated in the years after 2001, a development which will be examined in the next discussion. Yasutaka Tsutsui began his career as a science fiction writer. Since then he has distinguished himself as a unique figure in Japanese literary history, producing a variety of works ranging from pure literature to popular novels. Tsutsui has maintained a relationship with Azuma since endorsing the selection of his Ontological, Postal (Sonzaironteki, yubinteki, 1998) for the Mishima Yukio Prize as a member of the selection committee, taking part in a number of published discussions. The present discussion took place on the occasion of the reprinting of Tsutsui’s recent Stigmata (Seikon, 2013), to which Azuma contributed a commentary. Azuma read Stigmata as a kind of chronicle of postwar Japan, and asked Tutsui how it captures postwar Japanese society. Tsutsui replied, “all the tragedies, including the recent Tohoku earthquake, were minor when compared to the war.” War is as beautiful and riveting as it is tragic, and has the capacity to captivate many people emotionally. In Stigmata wherein the protagonist is a boy who had been castrated when an infant, Tsutsui sought to experiment with the depiction of the manner in which an individual or a society lives without desire as an allegory of postwar Japan. Azuma noted that one of the enduring characteristics of Tsutsui’s works is the sadness of their characters who realize the futility of their actions and their feeling of powerlessness. Tsutsui acknowledged that the expression of powerlessness is an important theme. Azuma analyzed that he expressed this as slapstick comedy in his early work, and as metafiction since his middle period. It was Virtual Men (Kyojintachi, 1981), where the characters in the novel struggle with the knowledge that they only exist within a fiction and tr y to live happily in vain, that served as a turning point. Tsutsui’s latest work Domain of Monad (Monado-no ryoiki, 2015) features a transcendental figure that goes by the name “GOD” whose vision penetrates the structure of the world. W hen asked why he chose God as his theme in the novel, Tsutsui confessed that though he himself was not a person who believed, he always sensed that someone different from the gods of all the existing religions was watching him from above. Azuma suggested that Tsutsui’s metafiction flowed from this quasi-theological sensibility. Lastly, Azuma highlighted Tsutsui’s history of traversing genres as an actor and musician. The diversity of Tsutsui’s artistic activities has greatly contributed to bringing a diverse and varied imagination to literature, and thus enriching the tradition of Japanese literature. The French philosopher Quentin Meillassoux developed a new direction in contemporary thought called “speculative realism.” His first book After Finitude was translated into English in 2008 and was acclaimed internationally. This dialogue celebrates the publication of its Japanese translation in 2016 by inviting co-translator Masaya Chiba to share his ideas. Chiba mainly studies the philosophy of Gille Deleuze, while the interviewer Hiroki Azuma has published a book on Jacques Derrida. Chiba’s introduction began by providing an outline of Meillassoux’s thought with a focus on After Finitude. Meillassoux accuses K antian and post-K antian philosophy for being correlationist. The problem with correlationism is that it limits the domain of philosophy to empirical rationality while the metaphysics prior to correlationism was nothing more than a dogmatism that depends on hypothesized absolutes like the Platonian idea or the Leibnizian monad. Meillassoux introduces here the dichotomy of necessity and contingency and tries to establish a new philosophy based on the latter, by which we can “access” something beyond K antian philosophy and the empirical sciences. He calls it a “speculative” method. Chiba and A zuma agreed that Meillassoux’s novel approach to an enduring issue in the histor y of philosophy is ver y unique and deser ves more attention. Chiba also remarked upon Meillassoux’s speculation on the idea of God. Meillassoux suggests that there is a “spectral dilemma,” where the world is far too unreasonable for any God to exist, but at the same time we fall into nihilism without the notion of God. Given this dilemma, he argues that “God may not yet exist, but will arrive in the future.” Just like ever ything else, the God may arrive contingently w ith no reason. Here we can avoid the dilemma and believe again in the possibility of salvation by an absolute God through philosophy. A zuma wondered whether such a philosophy based on total contingency could be a guide for one’s life. Later in the discussion, Graham Harman and Ray Brassier were introduced as thinkers who had related ideas. Despite being grouped together as speculative realist thinkers, their thoughts var y greatly. Harman, for example, takes the position of object-oriented ontolog y, which holds that all things, including inorganic material, have some subjectivity, and attempts to rethink their relationship with humans. Chiba and Azuma acknowledged that Graham’s ideas easily fit with contemporar y cultural studies because our lives are now surrounded by mechanical or v irtual icons. A zuma noted that the clear and demonstrative style of Meillassoux’s philosophy is far different from other French theor y authors who are dependent upon poetic imagination and metaphoric allusion. Chiba and A zuma concluded the dialogue by expressing their hope that inventive readings of Meillassoux will emerge and renovate philosophical discourse in Japan. The question of what constitutes “Japaneseness” in art became established as a theme through the debates involving Meiji era Japanese artists who practiced western style painting (yoga). During the Meiji era, Japanese artists clumsily imitated modern realism and historical paintings of the West using oil paint. Art historians of later periods focused on the feeling of disorientation in these paintings to locate their “Japaneseness.” Their arguments often employ the theories of comparative cultural studies, which assume that any unique characteristics in one culture only become visible through exchanges with other cultures. Nevertheless, such an assumption itself assumes that we have individual “locals” that can be juxtaposed to the “global,” an enduring and increasingly powerful dichotomy in the global art market today. The broadcast of the television puppet theater series Hyokkori hyotanjima began in 1964, the year of the Tokyo Olympics. Having separated from the mainland due to a volcanic eruption, Hyotan Island starts to drift, taking the children who happened to be on the island with it. The floating island becomes an alternative community composed of women, children, and outlaws. The main screenwriter of this puppet theater, Hisashi Inoue, began the serialization of his novel The People of Kirikiri (Kirikirijin) in 1973. The People of Kirikiri tells the story of an agricultural village of about 4,000 people in the northeastern region that declares its secession from Japan. This village possesses its own currency, language, military, and constitution. Furthermore, by securing complete self-sufficiency in food and energy resources through geothermal power generation, the village had overcome unsolved issues that plagued Japan during the 1970s. From Hyokkori hyotanjima to The People of Kiriikiri, in this essay, Hayamizu explores the issue of independent states through a comparison of Inoue’s two works carrying the motif of “secession from Japan.” We can find there the various political problems that were present and actual in 1970s Japan, and the Japanese government’s inability to solve them. In the summer of 2015, Ide had the opportunity to visit Russia and travel freely for an extended period of time. This article recount s his experiences in Russia in the form of travel writing, particularly in Moscow and St. Petersburg, through the lens of dark tourism. In Moscow, Ide probed the transition from the USSR to the Russian Federation from the perspective of a traveler. He pondred on the kind of traces of the past that can be found in the cityscapes and the words of the people who were liv ing in the Russian cities. The article also discusses how Russia manages the memory of World War II through a discription of the museum exhibitions that the author visited. These exhibitions depict the relationship bet ween Japan and Russia from a perspective different from Japan. They also describe the relationship between China and the USSR as fellow victors over fascism. In St. Petersburg, Ide ruminated on the shift from the Romanov Dynast y to the USSR while observing the way in which political crimes are depicted in museums and a fortress. This article reconstructs the candid thoughts of a tourist unfamiliar with Russia around the theme of modern history. The year is 2029. Japan has suffered a major earthquake, and humanity now predicts the entirety of its future using a mysterious quantum computer while inhabiting a phantasmal society generated by augmented reality. Our protagonist, Torihiko, along with the strange characters who surround him, embroil themselves in a strange life-or-death game in this world that involves a conspiracy involving the mysterious Tokihori family, time, and fate. In the Afternoon section (the concluding section) that began in the previous Genron issue, the characters finally come close to unraveling the mystery of warped time. This is the second chapter of this Afternoon section. While investigating Yuyuka Tokihori, the daughter of the Tokihori family who holds the key to this story, Ikuno Shinomiya, the police inspector who was approaching the center of the Disclonia Syndrome incident, dies in the line of duty leaving Kiritani, her coworker, at a loss. Meanwhile, still confined to the grounds of the Tokihori estate, Torihiko continues to prepare his Youclonia Plan to slaughter Yuyuka and at last completes work on the kakuryo, an augmented reality device used in the Tokimeguri-sai, a festival central to his plans. However, the Tokihori’s family maid, Kirishima, tells Torihiko that Yuyuka suffers from the rare condition of fatal familial insomnia (FFI), and that she does not have long to live. W hen Torihiko goes to the Tokihori family dining hall for a typical meal, Yuyuka’s mother, Miyu Tokihori, delights him by telling him a certain important individual w ill come during the Tokimeguri-sai. A s the two debate Yuyuka’s illness, the doorbell rings. The sudden arrival of an unexpected visitor puzzles the inhabitants of the estate. The Tokihori family, the machine intelligence, the police force, and Torihiko: where are these four wills headed? The shocking “Afternoon” begins its dash to its end.